Not very long ago, the first Apple watch hit the market, changing the world of wearable technology forever. These watches had the features that no one thought were possible. 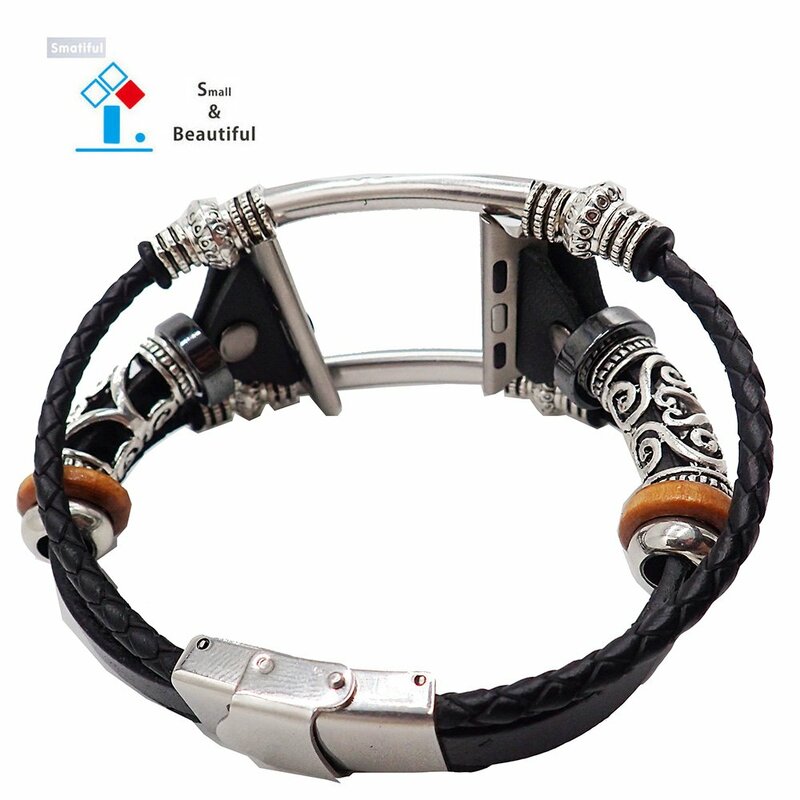 No wonder, it attracted a lot of third party accessories manufacturer, who then started developed attractive accessories like bands for them. Presently the market is full Apple bands and other accessories. Dealers like Limitless have some of the most amazing options for every Apple user. However, some products are far ahead in innovation than others. They are unique in terms of looks and well as performance. Here are some examples of such bands that every iWatch user will find attractive. Apple watch is awesome gadgets to carry during camping, trekking and a lot more outdoor activity. Not only, they help you with GPS, connectivity, music, and tip but they are also beneficial for survival activities if you have a paracord band attached to it. This band has seven inner strands of 550 lbs a metal clasp with a company logo on it. You can use these strands for fishing, bow drills, hanging stuff, creating a shelter, securing items and a lot more. Moreover, it is not only for emergency survival; it's also a unique option as a style accessory. 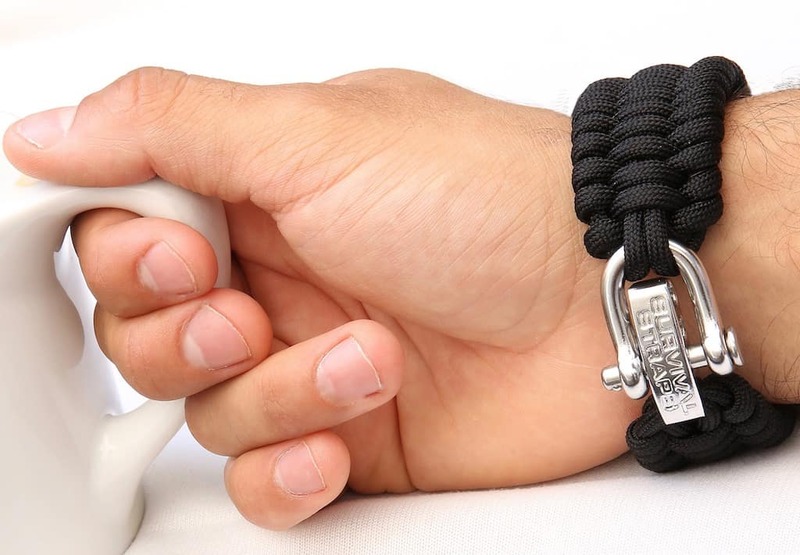 Further, this band comes with a stainless steel shackle that is completely adjustable. You can find them in sizes 7 ¼ inches to 8 ¼ inches and 10 ¼ inches to 11 ¼ inches for 44mm series 4 Apple watches. Limitless bands are known for their unique and elegant designs, and Limitless Fusion band is no exception. This loop is like an ultimate combination of a classy and a link bracelet. It further has a firm locking clasp that guarantees total safety of your watch. It's composed of a very light Zinc alloy material, but don't be fooled by its weight, it's utterly durable and robust. This band is available in, black, classic gold, rose gold and silver colors. As for the sizes, limitless makes this product for 38, 40, 42 and 44mm for all apple watches of Series 1, 2, 3, 4 and special edition watches like Apple sport and watch edition. In short, this one is the best deal for every apple watch user. A deal, which you should not let go at any cost. The Apple watch customers, who are more casual types, should try this band. This band is elegant, fancy and unique in both its look and built quality. It combines the funky look of leather strips with the strength of gunmetal and provides you a very appealing design. Moreover, it has a strong holding mechanism that will take care of the safety of your watch. Its high-grade connector holds everything very firmly, even during tough conditions. You can buy this leather grain band for all the 38, and 40 mm apple watch whether it is a series one product or latest models like series 4 watch. It is ideal for wrists of 5.5 inches to 8.5 inches. You can also reduce its size by cutting the rope. 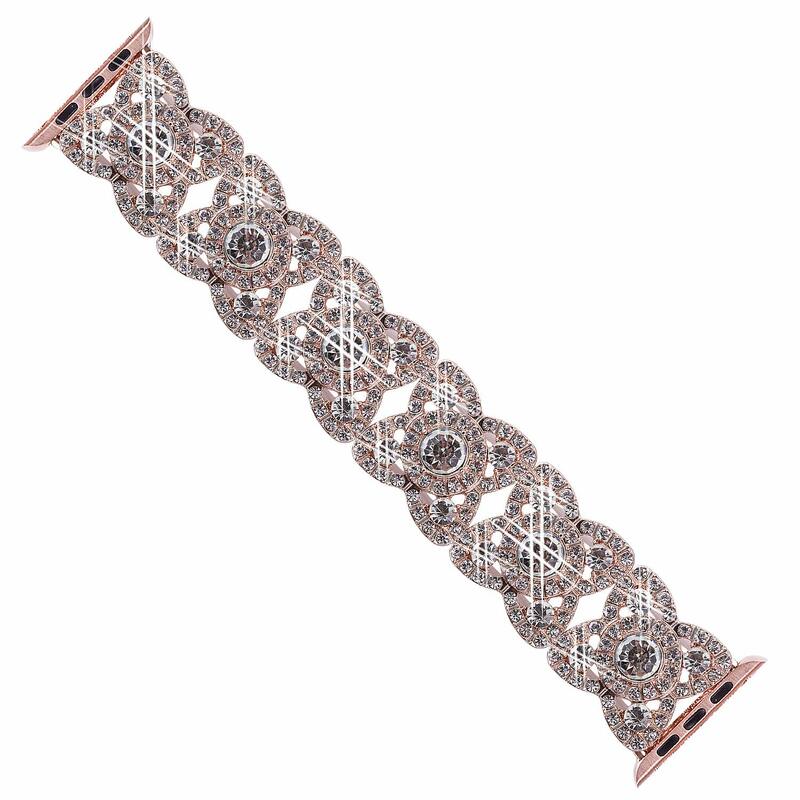 Tomazon Pearl band is an exclusive product for girls who like casual watch bands. This chain has a very fashionable handmade design that consists of gorgeous faux pearls. It also has stretchable ropes that are easy to slip on and eliminate the need for a buckle. However, it does have a locking system to lock the apple watch. You can trust this band for no tool fixing, stable adaptors, flexibility, and comfort. It is an ideal product for5 every occasion, although it has limitation for sizes. It comes with lengths of 5.7 inches to 6.9 inches for 38mm variant of Apple watch 1, 2, and 3 only. Delicate craftsmanship and unique design are what this loop so special. The infinite loop bracelet is another gem from the well known Apple watch band provider, Limitless. This unique band is the most comfortable and stylish alternative for all the plastic and rubber bands. It is developed from an ancient Milanese armor design and consists of many stainless steel threads, woven together. These threads ensure that your wrist get enough breathing space and you can wear the watch for prolonged periods without any discomfort. Moreover, it comes in shades of blue, rose gold, purple, vintage gold, black, and silver, for all Apple watches. You can buy this band for 38mm, 40mm, 42mm, and 44mm Apple watch of series 1, 2, 3, 4, and special editions. Something most other company cannot say about their bands. Apple watches and their bands have no limitations, and this bling bracelet is a live proof of it. This metallic fiber band comes with rhinestones and artificial crystal that makes it looks like a precious jewelry piece. It’s an excellent choice for parties as well as regular working days. Moreover, it consists of multiple parts that are held together with an elastic band. It doesn't need a locking mechanism, which means, you can slip it on or off at any time. This elastic also ensures that you get a comfortable fit and high durability with this product. You can buy this product in sizes of 5.7 inches, and 6.8 inches for Apple watch 1, 2, 3, and 4. The band is compatible with all 38mm, 40mm, 42mm and 44mm watches of these series. These are just some of the unique bands for your Apple watch. 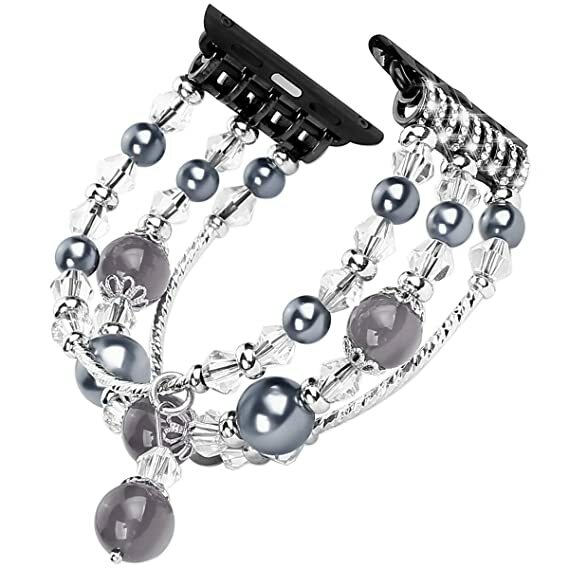 There are a lot more like Limitless Confidence and Elegance bands that you can try. The thing is, there's no limit of choice for this advanced gadget. Just, try to explore, and you will realize there are bands for all your style and needs. So, don't just stick with the dull, old and boring Apple watch bands, Upgrade. Get something that can match the uniqueness of you and your Apple Watch.